Named after the messenger of the sea, the Sebage Triton Three-Eye communicates true nautical style. Available in premium full grain leather, its leather quarter lining and fabric vamp lining provide sockless comfort. Flexible Strobel construction is coupled with smart details, like a padded tongue, functional lacing, and corrosive-resistant Sebago® eyelets. Comfort features include a nylon shank for support, as well as a lightweight EVA midsole. Sebago® Triton™ rubber cups sole provides non-marking, slip resistance. These are fantastic shoescomfy from the off and long lasting. Love Sebago shoes. Love the discounted price also. Excellent shoes to replace an existing pair which are still giving very good service as casual shoes and occasionally as deck shoes good non marking soles and a comfortable wide fit. Third pair Ive had and wont be the last. Not cheap but stylish and beautifully made shoes that last! Lovely shoes bought them before and these were to replace some worn out ones. Third set of Sebago shoes I have purchased over the last few years. Very happy with all the purchase. Brilliant shoe my identical pair that Ive had for years and had a hard life finally looked too worse for wear that I felt obliged to replace them. These new ones are every bit as comfortable and high quality. Thoroughly recommend them. Well made good quality and comfortable. Only just got them so will have to see how they fare but they are light and comfortable and I am sure they will be very good. This is the sixth pair of Sebago Triton shoes I have bought as they cant be beaten for comfort and fit. Look smart for casual wear or smart. My third pair. Very versatile smart and comfortable. Just what it says on the tin arrived on time (following day)via DPD and have been wearing them ever since! Light comfortable shoes. Too early to give 5 stars but worth it if Im still wearing them a year from now. I wear these continuously and find them comfortable supportive durable and stylish. 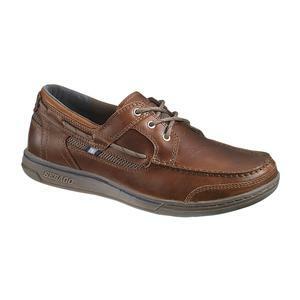 Great deck shoes, this is the forth pair for my husband, worn at home as well as on the boat.